It is vital that today’s engineers work with computer-based tools and techniques. However, programming courses do not provide engineering students with the skills that are necessary to succeed in their professional career. Here, the authors propose a novel, practical approach that encompasses knowledge assimilation, decision-making capabilities and technical agility, together with concepts in computer-aided engineering that are independent of hardware and software technologies. Fundamentals of Computer Aided Engineering provides support for all students involved in computer-aided engineering courses in civil, mechanical, chemical and environmental engineering. 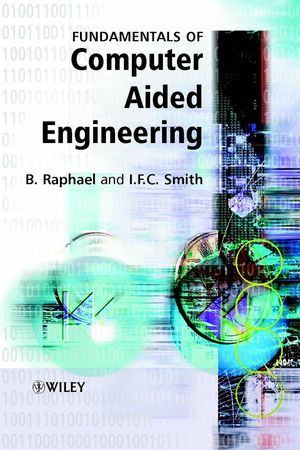 This book is also a useful reference for researchers, practising engineers using CAE and educators who wish to increase their knowledge of fundamental concepts. Benny Raphael is an Assistant Professor in the School of Design and Environment at the National University of Singapore. His main areas of research include Computer-aided engineering, Optimization and Machine learning. Ian Smith is Professor and Head of the Applied Computing and Mechanics Laboratory within the Civil Engineering Institute in the School of Architecture, Civil and Environmental Engineering at EPFL. He has also been active in consulting related to monitoring structures, applications of information technology, structural design, evaluation and repair of existing structures and accident analysis in Europe, North America and Japan. He was elected to the Swiss Academy of Engineering Sciences in 2004 and received the Computing in Civil Engineering Award from the Amercian Society of Civil Engineers in 2005. HE is Editor of the"Journal of Advanced Engineering Informatics", and Associate Editor of "Journal of Artificial Intelligence for Engineering Design Analysis and Manufacturing". 1. Fundamental Logic and the Definition of Engineering Tasks. A Model of Information and Tasks. The Five Orders of Ignorance. Program Execution Time versus Task Size. Practical Methods for Determining the Complexity of Algorithms. Conceptual Structural Design of Buildings. 4. Object Representation and Reasoning. An Object-O riented Design Methodology. From Physical Equations to Practical Systems. Reasoning with Constraints on Discrete Variables. Reasoning with Constraints on Continuous Variables. A Closer Look at Genetic Algorithms. 9. Knowledge Systems for Decision Support. Important Characteristics of Knowledge Systems. Importance of the User Interface. A Closer Look at Artificial Neural Networks. Mathematical Models for Representing Geometry. 13. Distributed Applications and the Web. Distinctive Features of C/S Systems.